A Better Way To Say "Thank You." When words alone won't do it, nothing "gifts" better than a great big oversize box of candy! Our Vintage Candy Gift Boxes bring back sweet forgotten memories of childhood (we'll throw in some Wax Lips, just to be sure! ), drawing out truly nostalgic memories! Presenting Vintage Candy Co's Thank You Gift Candy Box. This very special thank you gift helps you say thank you in a light and fun way. We've Loaded Your Candy Box With nearly 3 Pounds (Over 65 Pieces!) of Vintage Candy Memories which are appropriate for all candy eatin' ages. Order now and let's give someone a sweet thank you candy gift that will be received with a chuckle and a warm smile. 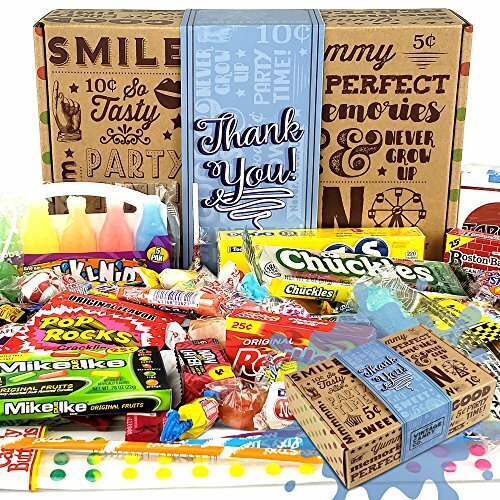 THE VERY BEST THANK YOU GIFT BASKET CANDY BOX FOR MEN AND WOMEN. GIVE THEM A BIG THANK YOU THEY'LL REALLY ENJOY. FUN, MEMORABLE AND SURE TO GET A BELLY LAUGH. A NOSTALGIC BLAST FROM THE PAST EVERYONE WILL LOVE! WE STAND BUY OUR 100% SATISFACTION GUARANTEE FOR ALL OUR CANDY BOXES.